The MFES-Tacoma is available in 5 configurations. The C2 configuration is shown here with standard High-Performance Skid Plate System. Spring Branch, Texas — Pronghorn Overland Gear, manufacturer of high performance, US-made expedition and off-road gear, begins production of the new Modular Front-End System for the Toyota Tacoma (MFES-Tacoma) and also announces introductory group-buy discount program for the MFES-Tacoma. 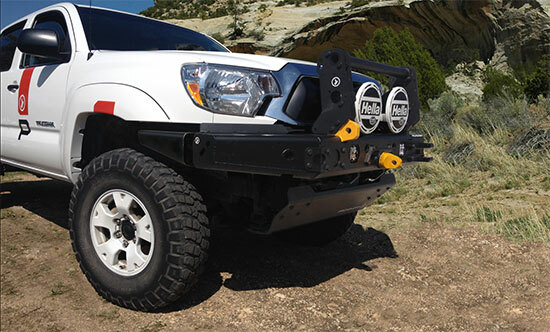 The MFES-Tacoma brings Pronghorn Overland Gear’s proven modular front-end system design to the off-road capable Toyota Tacoma (2005-2015 models). The MFES-Tacoma brings many of the high performance and high-functionality innovations found on their popular MFES-JK system (for the Jeep Wrangler) to the Toyota Tacoma platform. These include Pronghorn’s innovative fully-modular design, with five interchangeable configurations, and 6061-T6 aluminum construction to deliver high-strength, lightweight performance for severe-duty off-road and expedition applications. All MFES systems feature four levels of high-performance recovery points (ranging from 17.5K to 45K pound load capacities), as well as their innovative GearMount™ Accessory System, which offers a wide variety of winch and accessory mounting options. The GearMount Accessory System is also compatible with the upcoming Modular Rear-End System (MRES), and Side Rail System; along with our forthcoming accessory line, including cargo racks, work and cook tables, motorcycle racks, and more. All Pronghorn Overland Gear components are US-made and feature a full lifetime warranty. Not every expedition and off-road vehicle is going to need the same front-end system, that’s why the MFES-Tacoma is available in 5 configurations. Your trails may be about thick brush and possible animal strikes. If so, meet the full grill and headlight protection of our C5 configuration. Desert and open country more your terrain? The C1 system may be just what you need. Pronghorn’s fully modular design offers 5 interchangeable configurations letting you design the system you need. Then easily upgrade and reconfigure as your expedition and off-road requirements change, easily reconfiguring the system using simple hand tools. They can also easily add various recovery and functionality accessories as needed. View all 5 configurations on the company’s website. As an introductory offer with the launch of MFES-Tacoma production, Pronghorn Overland Gear is now accepting pre-orders for the MFES-Tacoma systems though the company’s MFES-Tacoma Group Buy program. Participating customers will receive a 25% discount (off retail price) in exchange for a refundable deposit of $375.00 (US). This introductory group buy period ends July 10, 2015. The MFES-Tacoma is designed for severe-duty expedition and off-road applications, features 6061-T6 and 7075-T6 aluminum construction for high-strength, lightweight performance, and is available in 5 interchangeable configurations. Designed and manufactured in the USA for the Toyota Tacoma (2005-2015 fourth generation). The MFES-Tacoma Group Buy is available for 30-days (June 10 – July 10, 2015) during which you can reserve your MFES-Tacoma and receive a 25% discount off the retail price (and 10% off all accessories) by placing a refundable $375 (US) deposit. At the end of the 30-day period (July 10) your order will be confirmed for any additions or changes and you will complete the pre-order payment process. At that point Pronghorn begins manufacturing of the MFES-Tacoma and within 10 weeks your order will be shipped and delivered via UPS Ground shipping for a flat rate of $75 (US). Estimated delivery: Sept 10, 2015. Pronghorn Overland Gear also offers their Modular Front-End Systems for the Jeep Wrangler JK (2007-2015). A fully modular design with 18 configurations allowing you to build, upgrade, and reconfigure to meet your specific requirements by simply adding or removing components. Also available for the Jeep Wrangler (JK) with high-performance front and rear bumper systems coming soon for the Land Rover Defender, Toyota Land Cruiser, and earlier Jeep Wrangler models.